Jean Arp is considered one of the most important artists of the twentieth century, as a founding member of the radical Dada movement in Zurich during the First World War. Initially trained as a poet, Arp went on to establish his sculptural practice with the Surrealists in Paris, who shared his rebellious Dada spirit against the logic and reason of bourgeois society in favour of an art form defined by nonsense. 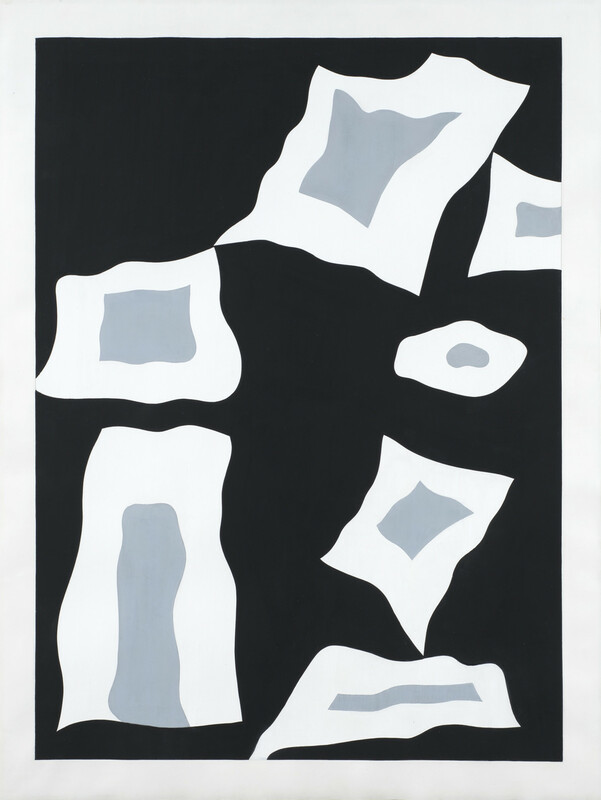 In the present large gouache ‘Ohne Titel’ from 1956, Arp evokes this sense of chaos through the seemingly random pattern of forms scattered across the page. Arp was particularly interested in the Surrealist notion of the unconscious and accident, which he developed in a series of ‘chance collages’ composed of torn pieces of paper dropped onto a larger sheet and pasted where they happened to fall. Arp recreates this practice in ‘Ohne Titel’ in an arrangement of shapes that echo the balance of his early Constellations and Configurations series. The biomorphic figures that glide across ‘Ohne Titel’ reveal Arp’s enduring fascination with the natural world and motifs such as seeds, plants and body parts, which he referred to as lyrical ‘free forms’. Throughout his career Arp returned to these organic bodies, driven by the idea that art can be defined by the same forces of transformation, growth and metamorphosis that command nature. Fellow Surrealist Max Ernst explained that ‘Arp’s hypnotic language takes us back to a lost paradise, to cosmic secrets, and teaches us to understand the language of the universe.’ The monochrome palette of ‘Ohne Titel’ also alludes to the black scribbles of text on a white page. Arp often used colour in this way to suggest the equal importance of literature and art. ‘Ohne Titel’ marks the decisive period of Arp’s career after the Second World War, following the death of his beloved wife Sophie Taeuber-Arp and return to the studio in Meudon outside of Paris. At this moment Arp’s reputation as one of the most famous avant-garde artists of his generation soared, as he received the International Prize for Sculpture at the Venice Biennale (1954) and a commission for the UNESCO building in Paris (1958). Arp was also the subject of major retrospectives at MoMA, New York (1958) and Musée National d’Art Moderne, Paris (1961).